A research group including Associate Professor Takeshi Shimosato (Director of Research Center for Fungal and Microbial Dynamism (CFMD)) and Mr. Yoshinari Yamamoto (3rd-year Doctor's degree at Bioscience and Food Production Science, The Interdisciplinary Graduate School of Science and Technology · Research Fellow (PD) of Japan Society for the Promotion of Science) found a DNA motif (oligodeoxynucleotide, ODN) which is effective in preventing severe sepsis. Sepsis is known as an organ disorder caused by bacterial infection. It causes excessive inflammation and blood coagulation, which leads to organ dysfunction and death. In this study, we focused on the platelet activating factor (PAF) involved in the onset of sepsis and the enzyme (PAF acetyl hydrolase, PAF-AH) breaking down PAF, and successfully selected the oligo DNA (CpG-A 1585) with strong PAF-AH inducing activity. In addition, very high survival rate was demonstrated in administration test of CpG-A 1585 on septic model mice. In the future, it is expected that it will lead to the development of cheaper drugs that suppress severe sepsis. This study was collaboratively carried out with Assistant Professor Suguru Shigemori of the Transborder Medical Research Center, University of Tsukuba, and Lecturer Takashi Sato of Graduate School of Medicine, Yokohama City University. 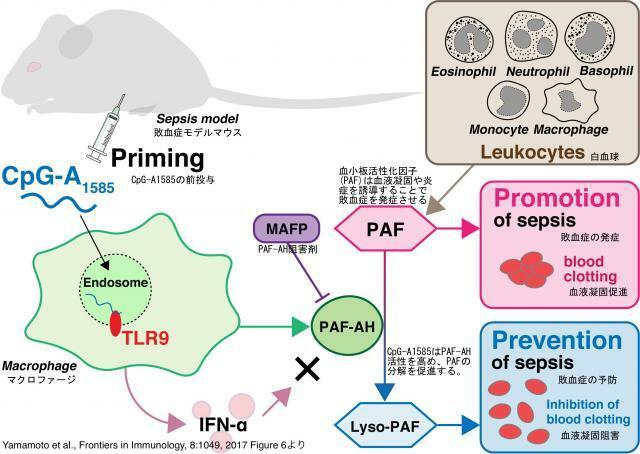 The paper is published in academic journal "Frontiers in Immunology". Yamamoto Y, Sugimura R, Watanabe T, Shigemori S, Okajima T, Nigar S, Namai F, Sato T, Ogita T, Shimosato T.
Class A CpG Oligonucleotide Priming Rescues Mice from Septic Shock via Activation of Platelet-Activating Factor Acetylhydrolase. Frontiers in Immunology. 8:1049, 2017.